Oh goat cheese, not only do you shine in appetizers and entrées, now you've stepped into the sometimes discriminating world of desserts...way to shatter that glass ceiling (you too, bacon). When I found this recipe in Better Homes and Gardens, I had to make it, immediately. I love recipes that call for an ingredient that's way out of left field (or is it "from" left field? I'm terrible with sports adages). Black pepper, chili powder, butternut squash etc...the line between savory and sweet is only as thick as we want it to be. If someone can figure out how to make Brussels sprouts edible (and by edible, I mean that they won't taste anything like what they are), please let me know! If you love the softy-assertive, twangy flavour of goat cheese, I think you will adore these brownies. 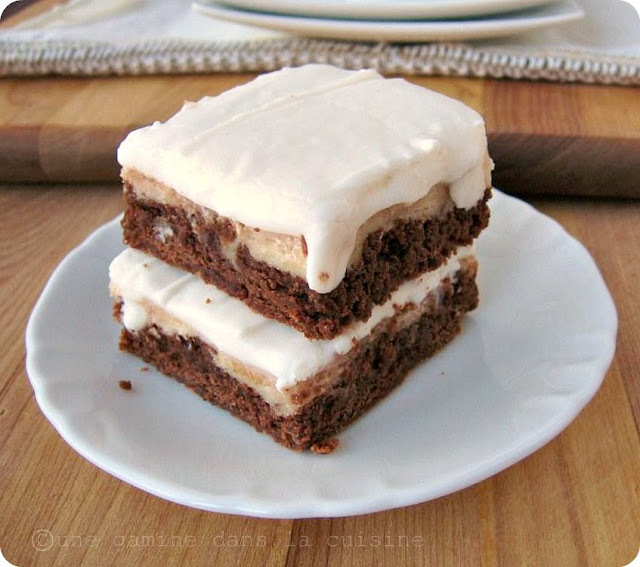 In fact, they may replace your go-to cream cheese swirl brownie recipe. The brownies themselves are a little bit on the 'cakey' side, but the creamy texture marries so perfectly with the chocolate, that any lack of fudginess is quickly forgiven. My favourite part of this recipe is, of course, the frosting. It's even better than cream cheese frosting (which is saying a lot). I'm already thinking about using this goat cheese frosting on a carrot or hummingbird cake. Just a quick note, If you're leery about using goat cheese in a brownie recipe, you can replace it with the same amount of cream cheese. I made both versions, and even though the cream cheese brownies paled in comparison, they were still delicious. Just be sure to use the actual goat cheese in the frosting. You do not want to miss out on that experience! Preheat the oven to 325 F. Line a 9x13-inch pan with foil, butter the foil and set the pan aside. Prepare the brownie layer: Fill a saucepan with about 1-inch of water and bring to just a simmer. Place the chopped chocolate and 3 Tablespoons of butter into a heat-proof bowl. Set the bowl over the saucepan (be sure that the bottom of the bowl does not touch the water). Melt the chocolate and butter, stirring occasionally, until smooth. As soon as it's smooth, remove the bowl from the heat and set it aside to cool as you prepare the cheese layer. Cheese layer:In a medium-size bowl, beat the cheese and 2 Tablespoons of butter on medium speed for about 1 minute (just to combine). Add 1/4 cup of sugar and beat on medium speed until fluffy. Add 1/4 cup of flour, honey, and 1 egg. Beat well (about 2-4 minutes). Set the bowl aside. Back to the brownie layer: Beat the 2 eggs on medium speed till foamy. Add 1 1/4 cups of sugar, milk, and vanilla extract. Beat on medium speed for about 2 minutes. Add the cooled, melted chocolate. Beat till combined. Using a large spatula, stir in 1 cup of flour, baking Powder, salt, and nuts (if using). Spread the cheese filling over the chocolate batter. Using large spoon-filled dollops, drop the remaining chocolate batter over the cheese filling. Drag a thin metal spatula through both the cheese and chocolate mixtures. Try not to overdo it, a few swirls here and there will go a long way. Bake for 40-45 minutes, or until the center is set. Remove the pan from the oven and onto a cooling rack. Cool completely before frosting. In a large bowl, beat the softened goat cheese and butter together on medium-low speed till creamy. It may look chunky at first, but it'll smooth out once everything is combined. Once 2 cups of sugar have been incorporated, add the honey and milk. Beat on medium-high speed until creamy. If the frosting is too thin, add more sugar in 1/4 cup increments until it reaches the correct consistency. If you prefer a thick frosting, add more sugar. Spread over the cooled brownies and cut into squares. You're a baking genious. You don't even like brussels maple roasted?! Oh. My. Goodness. Why didn't I think of that? Goat cheese has been my go to cheese for years now, but I have never used it in a dessert! Delicious. Mmmhhh, so irresistible and beautiful! Those are original brownies. Yay--I can comment again! I kept getting an error message on your apple tart the other night. i was heading back there, but got completely distracted by these. i love goat cheese much more than cream cheese, so I'll try this next time I want a cheesy frosting. 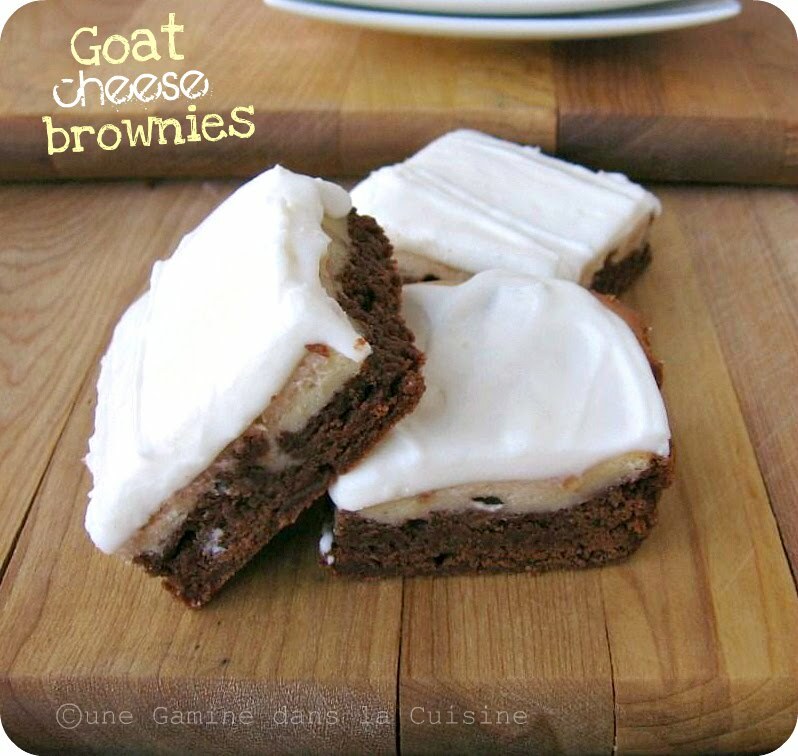 I was dubious when you mentioned goat cheese brownies the other day, but these look spectacular! These look fantastic! I love goat cheese and certainly can understand how the flavor would pair perfectly with a brownie. Definitely going on my 'must make' list! I loooove goat cheese... Tried to make a cheesecake with it, but people said it tasted a bit like a cowshouse...Maybe this is better, goat cheese it too good to be limited to entrées! They're definitely for those of us who truly ♥ goat cheese. I also love finding recipes with obscure ingredients. I made these today! I found a honey goat cheese to use for the cheese layer--and omitted the additional honey. I also toasted the pecans in the oven. That frosting is just unreal. The whole recipe is. just. unreal. Thanks for posting!!! 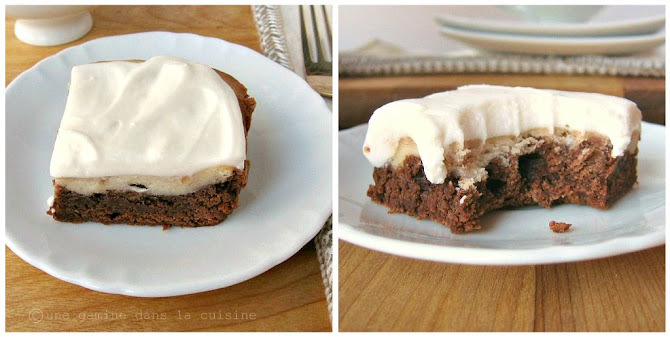 I've always wanted to try to make a goat cheese brownie...these look fantastic! What kind of goat cheese did you use for them? I used a french chèvre cheese. It's usually in small 4-6 oz. cylinders. I'm sure the brownies would be great with any kind of goat cheese, except feta..which is on the salty side. Who'd have thought?? So many savory things are being used in desserts, why not goat cheese? Which I love anyway. Can't wait to surprise my family with these, Valerie! I love goat cheese but combine it with chocolate and I could be in heaven! Thanks for sharing! I will definitely try this! 4)Remove the brussel sprouts (optional) and eat the cheese.